rebecca likes nails: i am loopy. froot loopy! I'm sure a lot of you have seen posts on this already, but here is mine. My lovely friend Leslie had a nail art competition and she got 48 entries!! I am in no way expecting to win, there are so many lovely entries, but I really do like mine! Haha. I'm entry #6. 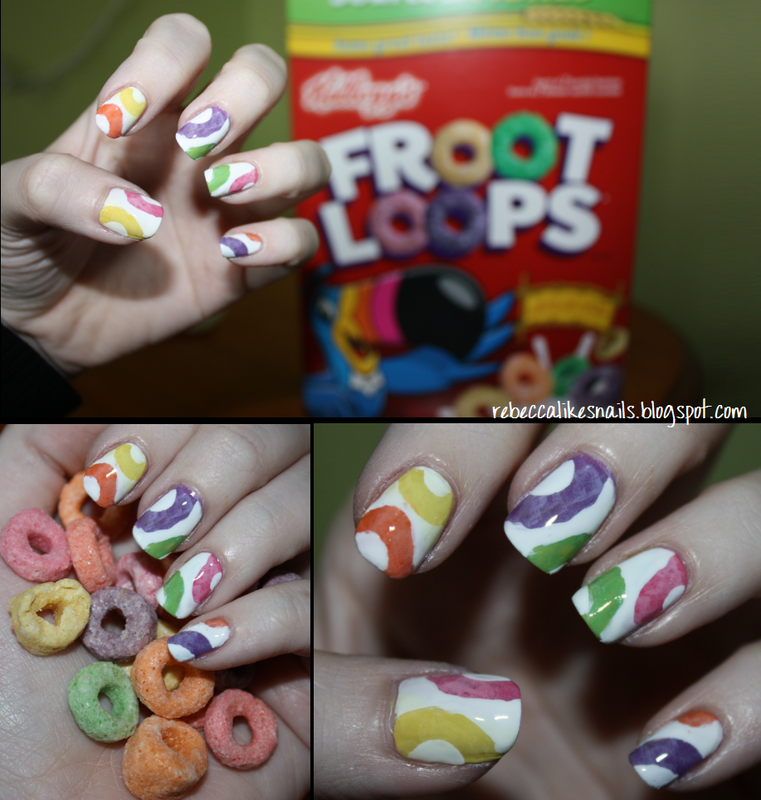 Froot Loops! Interested in learning how I did this manicure? I went about it in a sort of strange way. This is what I did first. I did the nails in random half-and-half patterns, and I sponged a lighter color on top of each one to give it that textured, Froot Loop look. Then I added hole reinforcements to each side, and painted over the while thing with white. I cleaned up any messy parts, added Seche Vite, and it was done! A bit of a silly manicure, but I like it all the same. Love it! How clever to sponge the colours first! hey we both joined the contest! best of luck! Super cute! And thanks for showing your "how to"; I don't think I would have thought of putting the colors under the white. I would never have guessed this is how you did it! I thought you would have painted over the white! Very cute and loopy! I like it ! It's so cute ! That's a great technique with the hole-reinforcements! The sponged details are really cool! I voted for yours! Fantastic! !